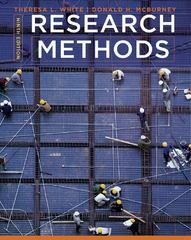 Research Methods 9 Edition Now in its 9th Edition, RESEARCH METHODS provides psychology students with a scientific approach to understanding their field of study and the world in general. The text's logical, step-by-step coverage is the result of decades of author experience. It includes all of the stages of the research process, from selecting the project and searching for literature, to choosing a protocol and getting published. RESEARCH METHODS also presents students with problems from selected psychological literature to demonstrate some of the creative ways psychology professionals design and conduct effective research.